Now that the trade deadline has passed in my highest priority fantasy football redraft league, it’s time to take a look at the five trades I made this year, to see how it’s affected my season so far, and its future outlook. The goal of this post is to show how you can overcome a poor draft (and subsequent poor start to the season), and still excel in your league by being vigilant with roster management, and using widely available tools to more accurately gauge past and future performance. This trade looks awful for me on paper, but at that point Calvin Johnson had just finished his second straight week playing as a decoy on a bum ankle, and was looking to be out the next four weeks (three games and a bye), putting him back for a return in week 10. If I could hang on two more weeks, I’d have Josh Gordon return, so Calvin was expendable. I had Ellington, Forsett (I picked him up having waiver priority), Bradshaw, and Miller as my RB quartet, so giving away Bradshaw didn’t kill me. 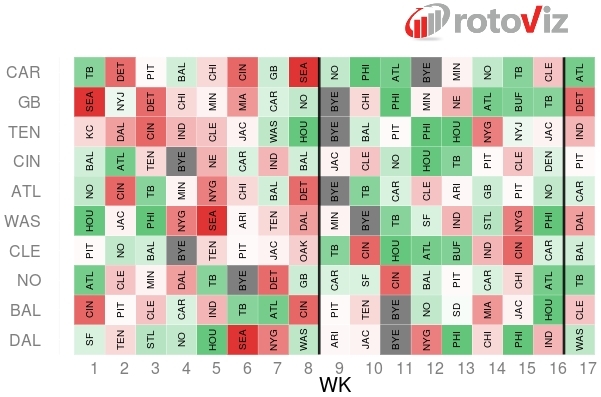 I used the Rotoviz Buy Low Machine and found that Eddie Lacy had an excellent upcoming schedule. After a tough match-up with Miami, six of Lacy’s next 7 games were great match-ups, including an excellent one in week 14, the first week of the fantasy playoffs. Bradshaw’s schedule wasn’t horrible, but he’s an older, injury-prone back in a timeshare, and Lacy was clearly a buy low prospect, having started the year off slowly. I pulled the trigger, and Lacy got me 35.5 points in the same time frame that Calvin Johnson got zero. 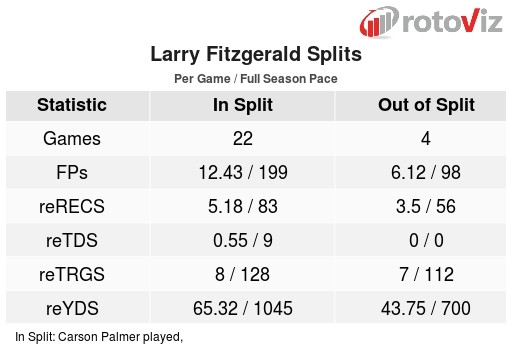 Also, I noticed using Rotoviz’s Game Splits App, with Palmer about to return, Fitzgerald was due for a bounce back in scoring. The easiest remaining schedule among WRs, Benjamin was definitely a trade target of mine. This led me to my final trade of the year. 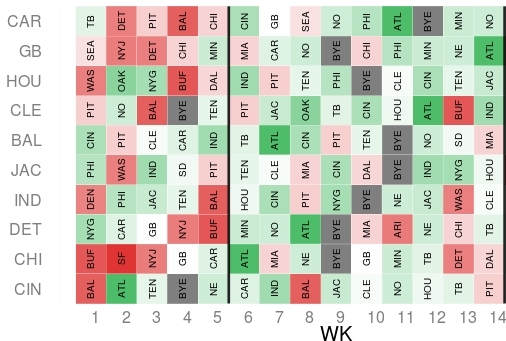 I had just picked up Tre Mason off waivers, but was not going to use him (especially given his upcoming schedule), and Watkins was an obvious sell high, coming off two 20+ point days, with the 10th toughest schedule remaining at that point according to the Buy Low Machine (or should I call it the Sell High Machine?). Watkins for Benjamin just made sense, and as a small bonus I got the Cincy D going up against lowly Jacksonville in week 9. Benjamin didn’t do so hot in week 9 despite the great match-up, but in weeks 10 and 11 he’s been a fantasy savior for me. Watkins put up a mere 6.2 points during those two weeks, although I don’t expect that trend to continue, as his schedule eases up a bit toward the fantasy playoffs. with three of his next four match-ups positive ones. I kept working the waiver wire, picking up Mike Evans who was only averaging 6.5 points per week before his weeks 9 through 11 blow-up. I was able to claim him off waivers by having priority after his big week 9 performance, giving me the WR quintet of T.Y. Hilton, Kelvin Benjamin, Mike Evans, DeSean Jackson, and Josh Gordon now eligible to return. I picked up Fred Jackson off waivers after he went down with injury. His injury was short term and I wouldn’t need him in that time frame anyway. As long as he’s back for the fantasy playoffs, I was happy to roster him. He’ll simply be insurance for the fantasy playoffs, where he has a good schedule. I was looking to make one more trade, shipping Ellington away and packaging him with one of my non-Gordon WRs to pick up another top RB given Ellington’s horrid fantasy playoff schedule and the injury to Carson Palmer, but my league-mates held tight and didn’t take the bait. Drew Brees has the 2nd easiest fantasy playoff schedule (weeks 14-16) for QBs. His schedule to this point in the year has rated 38.33 (on a 0-100 scale), but his playoff schedule rates a 69. I have three top 10 RBs, of which I need to start one or two in any given week. I’ll likely be picking either Lacy or Forsett or both depending on the situation. Ellington, Fred Jackson, and Sankey are insurance policy. I have four currently top 13 WRs plus last year’s #1 WR, Josh Gordon. I face the dreaded selection problem, but I guess that’s a good problem to have. In cases where either Forsett or Lacy have a bad matchup, I’ll probably go 3 WRs. Alfred Blue and Jordan Reed will be the guys I’m looking at cutting to either handcuff an RB, grab a backup QB, or grab a TE with a better match-up for week 12 (Walker has a tough match-up this week, and Reed has a hamstring issue). Congrats if you’ve read this far! I really appreciate it. Hopefully I’ve shown that you can overcome a poor draft by being aggressive in trades, using tools available on the web (thanks Rotoviz for having some of the best tools available in my opinion! ), and working the waiver wire. I’d classify four of my five trades as positive value, setting me up nicely for the fantasy playoffs. Anything can happen in the fantasy playoffs, but I feel good about the position I’ve put myself in for those three weeks.